The first of many acts to cement the college town of Athens, GA, as a hotbed of alternative music, the B-52′s took their name from the Southern slang for the mile-high bouffant wigs sported by singers Kate Pierson and Cindy Wilson, a look emblematic of the band’s campy, thrift-store aesthetic. The five-piece group, which also included founding members Fred Schneider, guitarist Ricky Wilson (Cindy’s older brother), and drummer Keith Strickland, formed in the mid-’70s after a drunken evening at a Chinese restaurant; the bandmembers had little or no previous musical experience, and performed most of their earliest shows with taped guitar and percussion accompaniment. 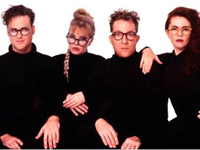 After pressing up a few thousand copies of the single “Rock Lobster,” the B-52′s traveled to the famed Max’s Kansas City club for their first paying gig. Subsequent appearances at CBGB brought the group to the attention of the New York press, and in 1979, they issued their self-titled debut album, a collection of manic, bizarre, and eminently danceable songs which scored an underground club hit with a reworked version of “Rock Lobster.” The following year, they issued Wild Planet, which reached the Top 20 on the U.S. album charts; Party Mix!, an EP’s worth of reworked material from the band’s first two proper outings, appeared in 1981. Released in 1982, Mesopotamia arose out of a series of aborted sessions with producer David Byrne which saw the B-52′s largely abandon their trademark sense of humor, a situation rectified by the next year’s Whammy!, a move into electronic territory. After a Schneider solo LP, 1984′s Fred Schneider & the Shake Society, the group returned to the studio to record 1986′s Bouncing Off the Satellites. On October 12, 1985, however, Ricky Wilson died; though originally his death was attributed to natural causes, it was later revealed that he had succumbed to AIDS. In light of Wilson’s death, the group found it impossible to promote the new album, and they spent the next several years in seclusion. Sign up for a recap of the day's newest additions.